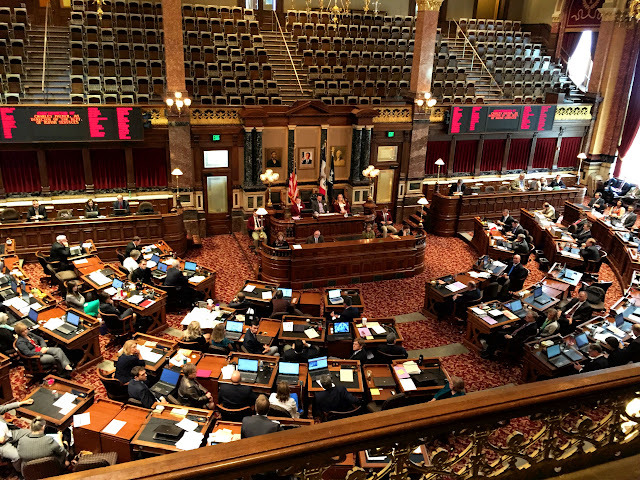 DES MOINES, Iowa— After driving from the Quad Cities, we arrived at the Iowa State Capitol in Des Moines around 2:30 p.m. 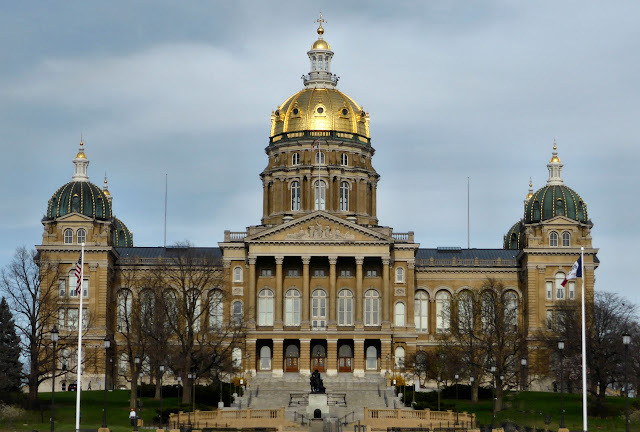 Upon approach, the Iowa capitol is quite impressive with a magisterial command of a hilltop overlooking the city. Visitor parking was located conveniently in front, at the bottom of a long approach of steps. 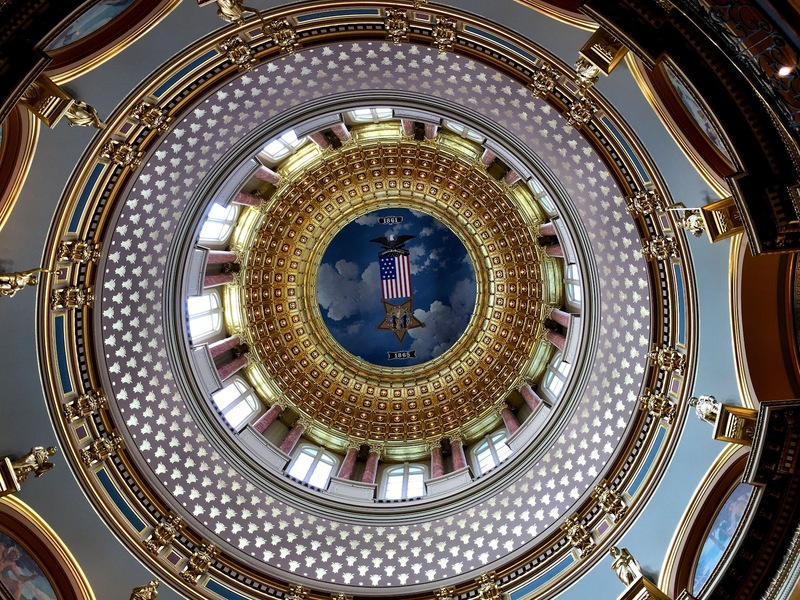 The Iowa statehouse has a massive gilded central dome surrounded by four minor domes covered in weathered copper. When we first caught sight of this dome-inence, we couldn’t stop the Dragnet theme song from burbling up: “Dome, dome, dome, dome. 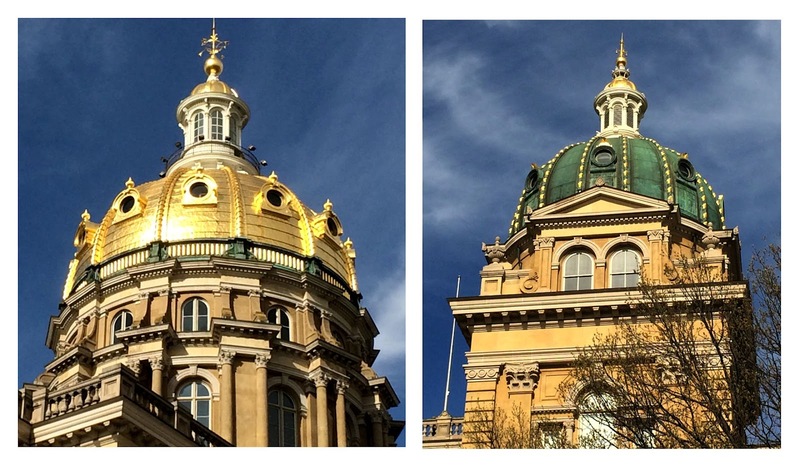 Dome, dome, dome, dome, DOME!” We were not surprised to learn that Iowa’s is the only state capitol with five domes. Security guards were friendly, and the standard screening was executed with a walk-through metal detector and bag x-ray. Unlike most statehouse security guards we’ve encountered, these two were dressed in street clothes—short-sleeve white shirts with ties—rather than law enforcement uniforms. At the tour desk, we were hooked up with Joan, a sixty-something, seasoned guide who was quite knowledgeable and clearly enthusiastic about her work. 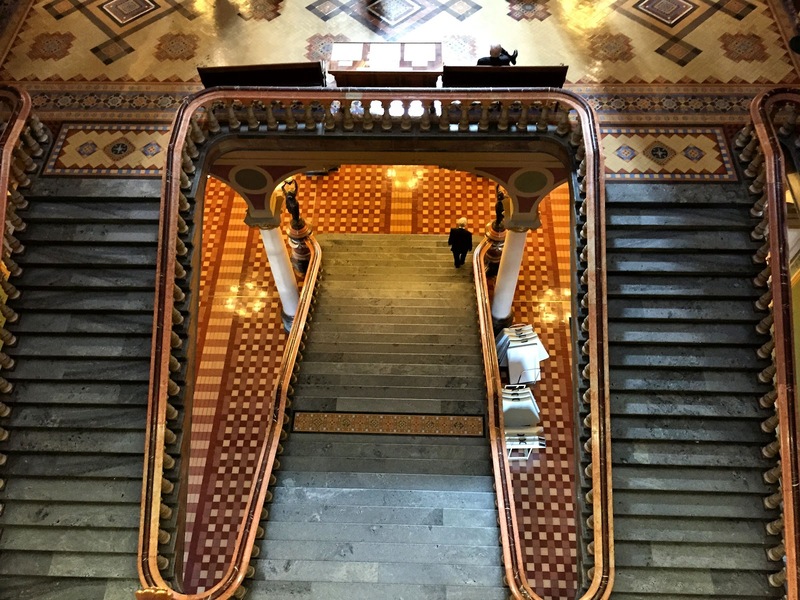 When she travels, she enjoys visiting other state capitol buildings, so we exchanged notes about our common hobby. Joan chuckled when we told her that our guide in Springfield had accused the Iowa statehouse of being a copy-cap. She acknowledged the common architect and suggested that he might have indeed submitted the same architectural plans for both since design competitions were held for each. 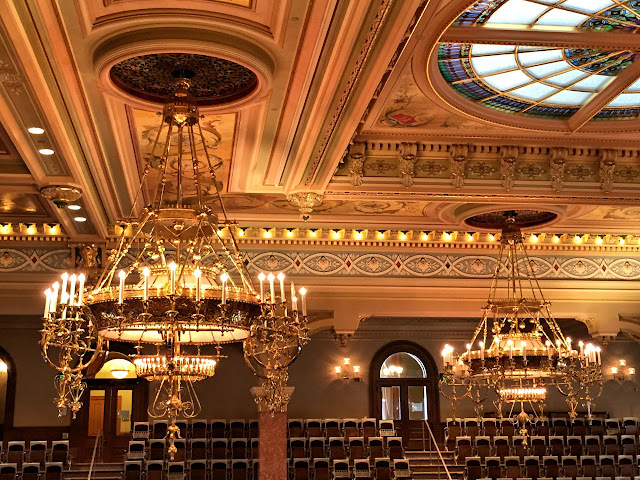 And she made a point to show us the bronze maiden light fixtures at the base of the grand staircase—those decorative adornments that Illinoisans were “too prudish” to accept in the 1800s. 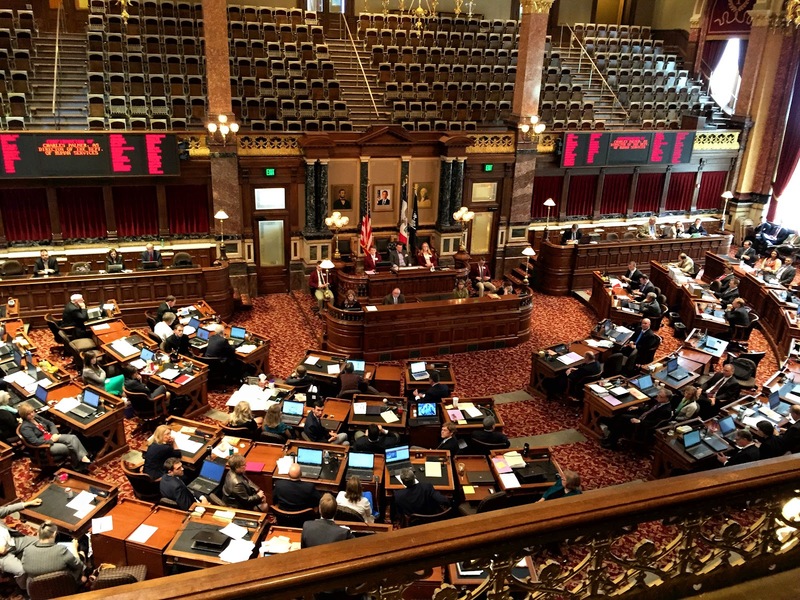 She was amused by the Illinois delegation that visited Des Moines a few years ago in an unsuccessful attempt to reclaim what they had rejected 140 years before. 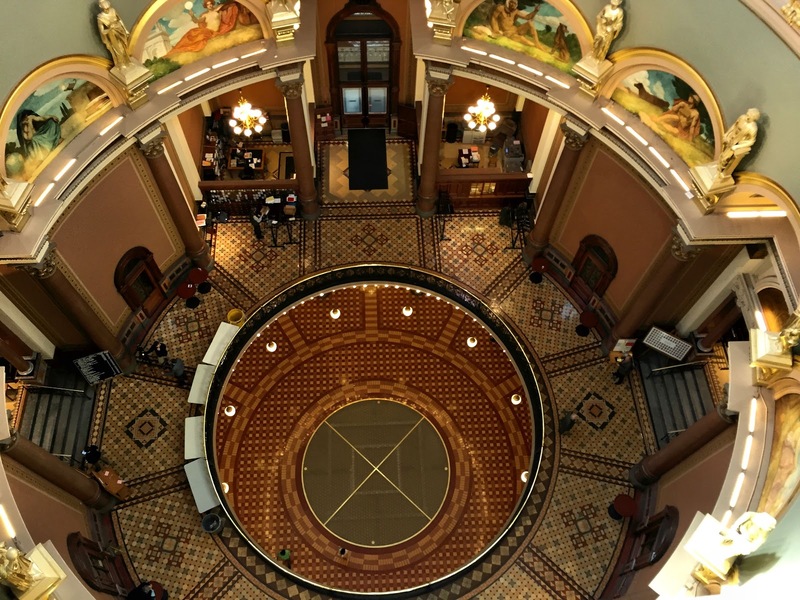 Like its Illinois counterpart, the interior of the Iowa statehouse is stunningly attractive. Both have been restored to their original vivid Victorian colors and palatial elegance. Gold leaf has been applied on some areas of the first floor. All wall decorations are hand painted stencils, though they may have the look of wallpaper. 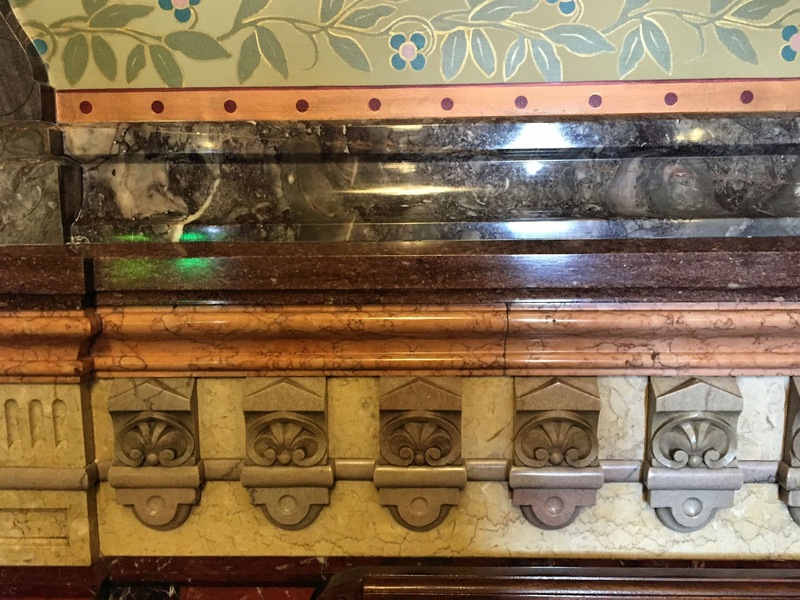 The stencils were meticulously restored to their original design in a 1980s renovation, and the Iowa capitol employs two full-time painters to maintain the integrity of the stenciling. The four minor domes loom over attic space used for storage. 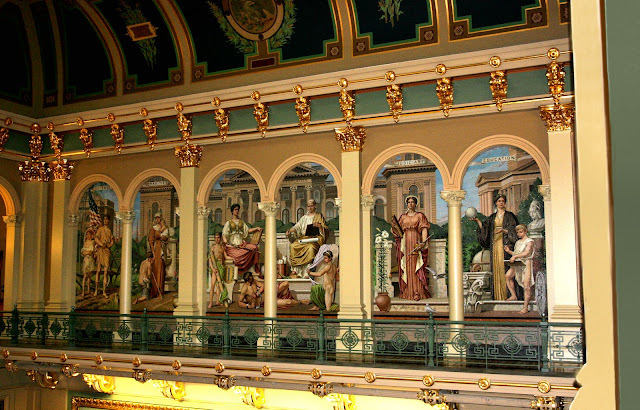 The central dome over the rotunda can be seen from the ground floor. A screen painted to resemble a cloudy sky is at the top center of the dome interior. Suspended below it on wire is a banner depicting the emblem of the Grand Army of the Republic, a fraternal organization for Union veterans of the Civil War. 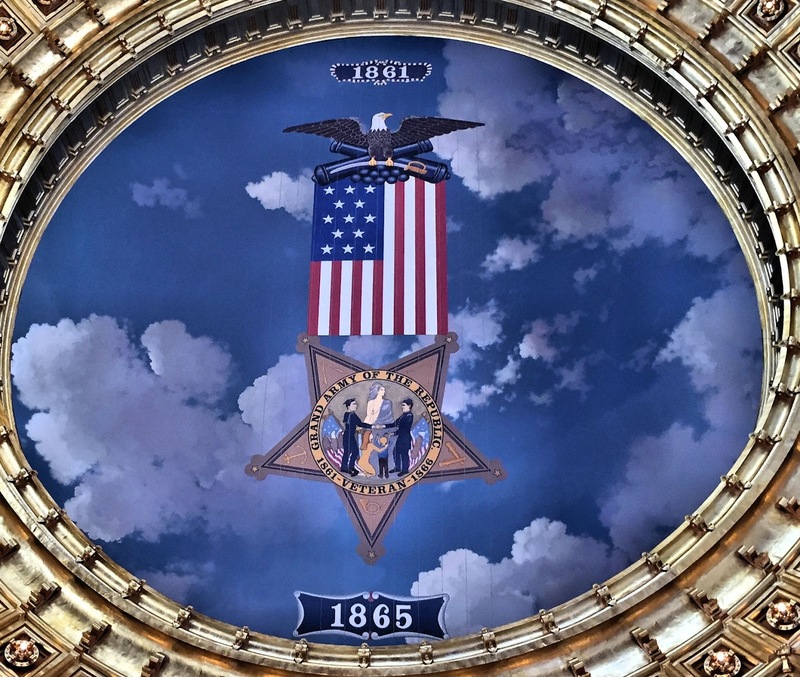 Installed when the GAR was at the height of its popularity, the banner commemorates Iowa’s efforts to preserve the union during the Civil War. Both legislative chambers are models of Victorian sophistication. 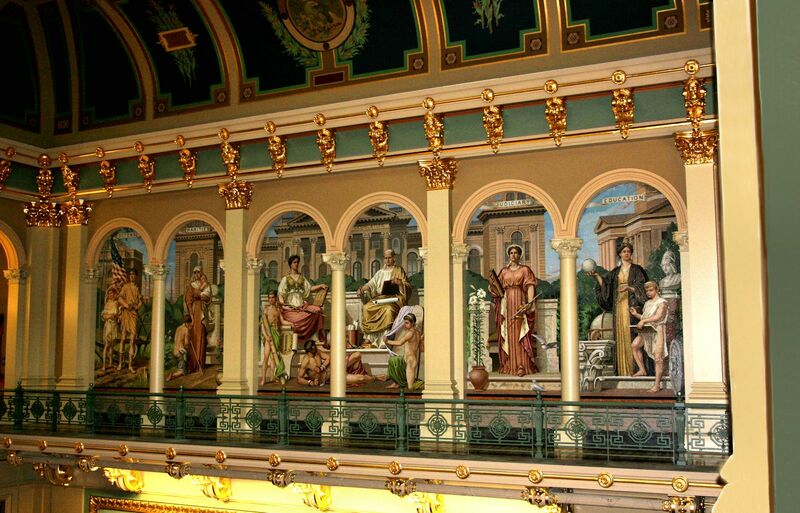 A 1904 fire damaged the ceiling of the House chamber, but the Senate’s remains original. 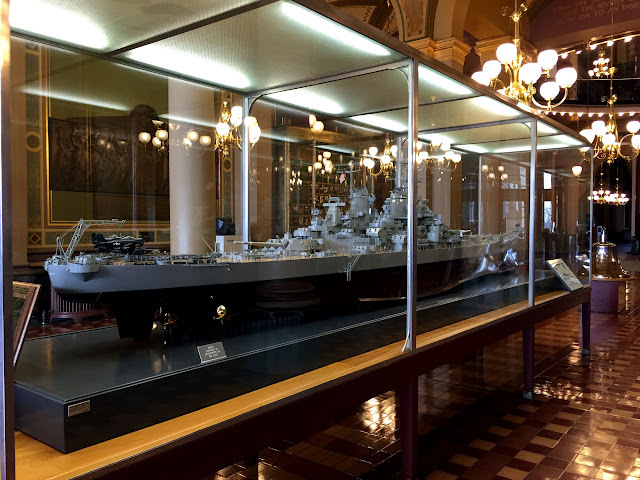 With the legislature in session, visiting the galleries today was a very different experience. 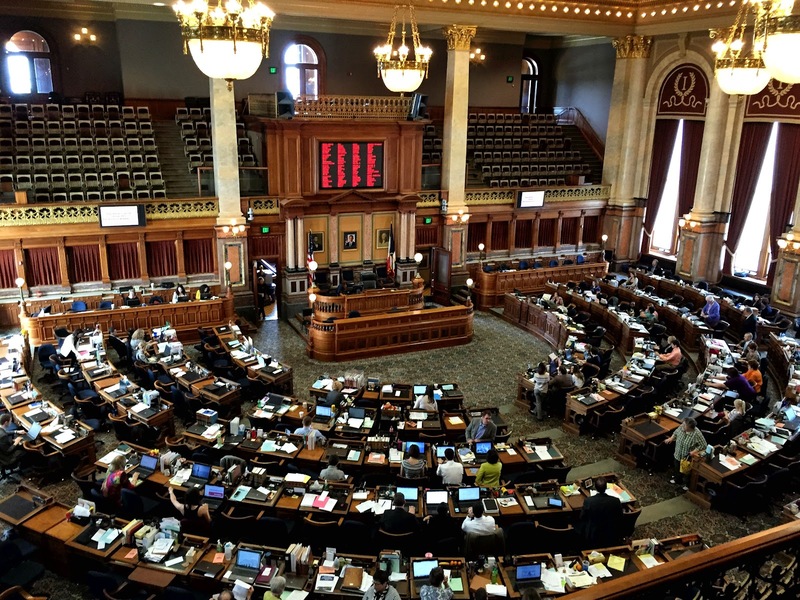 Fascinated to watch the legislative process, we listened intently to debates in each chamber. 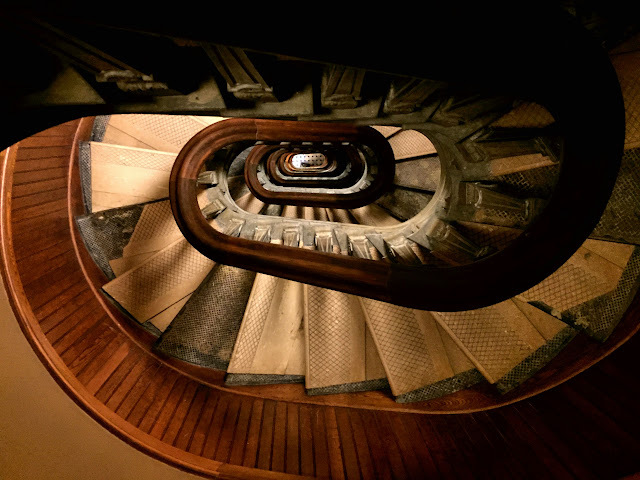 From the Senate chamber, Joan guided us up a spiral staircase of 98 steps to the whispering gallery within the dome. Created by the circular wall, a whispering gallery allows sound waves—even those at whispering volume—to be carried around the interior of the circumference to any other part of the circle. Of course, we had to experiment, and indeed a whisper carried across to the other side. 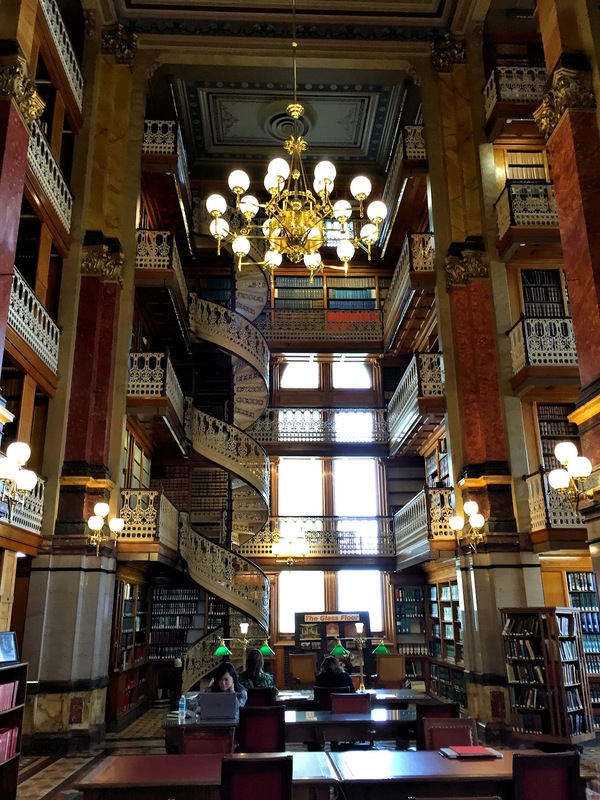 Back down on the second floor, we went for a look at the exquisite state law library, which houses more than 100,000 volumes on five levels. At each end of the room, twin iron grill spiral staircases allow librarians to access the books on all levels. The room is still in active use and, because of its opulence, is coveted by media teams who flock to the state at presidential caucus time. The envy of other networks, CBS currently has a contract to broadcast from the library. As in the Illinois capitol, every surface at the Iowa statehouse was gleaming. Clearly there is a well-placed pride in these museums of statehood and government. 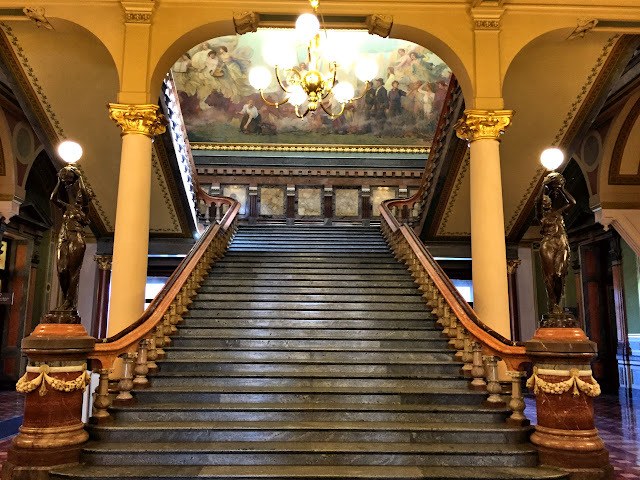 The Iowa building is filled with both classical and state-specific ornamental objects that speak of the state’s history and sense of place. It had no difficulty matching the outstanding level set by its neighbor. Height (to tip of main dome): 275 ft. Interior area: 330,000 sq. ft.
Dome, dome, dome dome, DOME!